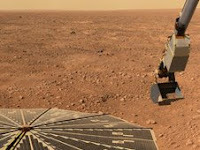 NASA's Phoenix lander sent its last data transmission on November 2nd, marking a successful end to a great mission. Shorter Martian day lengths and increasing cold and dust have put an end to Phoenix's ability to generate power for itself. Since Phoenix is on Mars' North Polar Region, its days get especially short during the winter months, much like on Earth. This shorter day leads to less time to charge the lander's batteries. Phoenix was an important mission, and provided us with some good data on the history of water on Mars. It verified that there is indeed water-ice on Mars, and showed that it does "snow" on the Martian North Polar Region. It also found calcium carbonate, a typical indicator of aqueous activity. NASA technicians will still be listening for any communications from Phoenix, in case it wakes up. So here's to a mission well-done! Actually powerful efforts once victimization the online website. we tend to like your reliable efforts with regards to at the side of most likely can trip for the aim of a lot of position victimization anyone since position made our kid’s satisfaction and provides chosen permits you to start exact same actual employment at this stage. Presently follow through Cash Advance Congratulations drastically for the aim of okay survey.